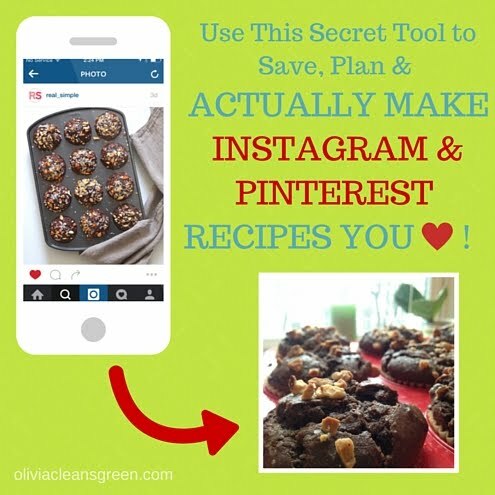 Olivia Cleans Green: The Secret Tool to Save, Plan, and ACTUALLY Cook Instagram & Pinterest Recipes You Love! 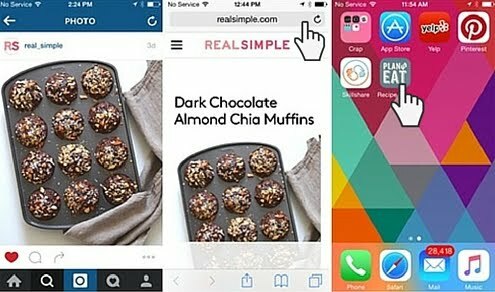 The Secret Tool to Save, Plan, and ACTUALLY Cook Instagram & Pinterest Recipes You Love! Make 2016 the year you actually make all the healthy and yummy recipes you discover on Pinterest and Instagram. To save, organize, and literally plan to eat recipes you discover online right from your smartphone, you need my secret tool: Plan to Eat. If you don't already have an account, join Plan to Eat for free now. (You can do this from your phone or computer.) Once that's set up you're ready to find recipes, plan meals, make grocery lists, and cook from your phone! Open Safari (or another web browser) to go to PlantoEat.com. Do not accept prompt to use the mobile version. It won't give you access to the recipe book. Click "Recipes" to go to your recipe book page. Click the “send to” icon at the bottom of the screen, which brings up several options. Find a recipe you love online. If you find something that looks good on Pinterest or Instagram, make sure you go away from there to the website that actually features the full recipe (not just the picture). Copy the URL (web address) of the page that has the recipe. Paste URL of the recipe into the Import box. Plan to Eat will automatically upload recipe and (usually) a picture. Make any edits if you'd like. Then click "Save Changes." The recipe is now saved in your Plan to Eat recipe book. You can now schedule when you'll make it and add the necessary ingredients to your shopping list with a few clicks. I find that planning is the best way to actually get something done. That's why I love Plan to Eat! These muffins I discovered on Real Simple's Instagram feed--and made the following day thanks to staying organized with Plan to Eat--were so good! Do you often end up making recipes you find on Instagram and Pinterest? How do you plan meals? Check out Plan to Eat to discover more ways to make meal planning simple.